I arrived in Rome in the rain, grateful for the end of a long, bumpy flight. Though tempted to kiss the ground, mimicking Blessed John Paul II’s customary arrival gesture, I opted not to; in my case, rather than an act of pious humility, it would have been an act of desperate relief. My fellow aviophobes, those among us who are intensely afraid to fly, might have understood, but very few others would. In any event, all things papal, and not just Blessed John Paul’s travel habits, were much on my mind. Like thousands of others—journalists, priests, religious, general curiosity seekers—I had come to Rome for the papal conclave. By my count I am the third editor in chief of America to observe a conclave up close. 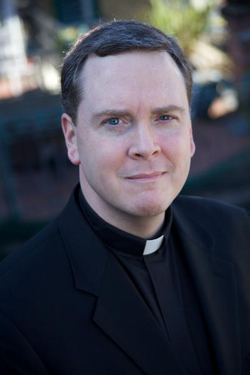 Thomas J. Reese, S.J., editor in chief from 1998 to 2005, wrote a whole book about the Vatican and the conclave process. Another of my predecessors, Joseph A. O’Hare, S.J., was lucky enough to be in Rome during the historic year of three popes in 1978. I arrived in the Eternal City with neither expertise nor the expectation of good luck. Still, I had arrived in historic circumstances: a conclave occasioned by the first papal resignation in 600 years. It was late and I should have been exhausted, but the lingering adrenaline from my fight-flight response on Alitalia had me wide-eyed. When another Jesuit suggested that we head down to the square to see the newly installed chimney on the roof of the Sistine Chapel, I readily agreed. Even in ordinary circumstances, you cannot approach St. Peter’s Square without expectant wonder. On this night, though, the walk is especially soul stirring; the place is filled with expectation, almost pregnant with hope; something familiar yet entirely new is about to happen. Even on this dank night, the square is filled with pilgrims; they are joined by dozens of journalists readying their klieg lights, studying their notes. How many similar moments—minus the klieg lights—has this place borne, I think. How many billions of people for trillions of minutes? Behind the scrim of time, against the backdrop of a fallen world, how many stories of faith, hope and love, have been enacted on this ancient stage? Impossible to say, really, except in faith. We are told that we live in a post-modern world, that our common story is just so much mythology; that our “grand narratives,” to use Jean-François Lyotard’s famous phrase, have disintegrated and are irretrievable. Our 140-character contemporary culture seems to confirm that view. Perhaps, then, the world is in mourning, grieving the loss of its dreams, those irretrievable grand narratives. Are we right to mourn, though, or are we grieving for that which was always dead? What was it that Cardinal Joseph Ratzinger said just before the last papal election? “How many winds of doctrine have we known in recent decades, how many ideological currents, how many ways of thinking? The small boat of the thought of many Christians has often been tossed about by these waves—flung from one extreme to another.” The pope emeritus, it seems, is a postmodern man: to him, the grand narrative is a dangerous modern fantasy. This article also appeared in print, under the headline "Of Many Things," in the March 25, 2013 issue.